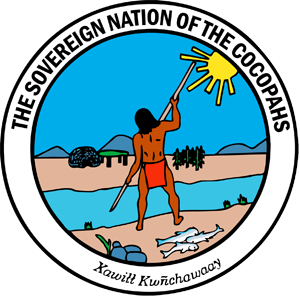 The Cocopah Indian Tribe Reservation comprises three noncontiguous bodies of land known as the North, West and East Reservations and is located in Yuma County along the Colorado River just 13 miles south of Yuma, AZ, and 15 miles north of San Luis, Mexico. The Reservation's unique geographical location borders the United States, Mexico, Arizona and California. 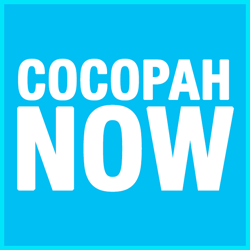 Cocopah Casino, Cocopah Resort & Conference Center, Cocopah Korner and Cocopah Rio Colorado Golf Course are located minutes south of the City of Yuma on Highway 95. 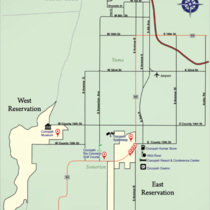 The Cocopah Museum is located near the Tribal Headquarters on the West Reservation. Cocopah RV & Golf Resort is located on the North Reservation. The Cocopah Indian Tribe has a long-standing commitment of helping agencies, organizations and individuals around the community. Requests are reviewed once a month and announced during Tribal Council meetings that take place the second Friday of each month. Please send request at least a month before your event since requests are looked at only once a month. In the letter please include name, phone number, email address and mailing address. Donations may be delayed or denied if complete contact information is not provided. If you request is approved you will recieve a phone call. You will recieve an email if it's denied. The Cocopah Public Relations Department at 627-2102. The Cocopah Resort & Conference Center, featuring a modern Southwestern style with soft colors and natural landscaping, sits on the rise of a desert mesa overlooking the picturesque Yuma Valley. Both Cocopah Casino and Cocopah Bend RV & Golf Resort offer accommodations for RV travelers visiting our neck of the Sonoran Southwest. 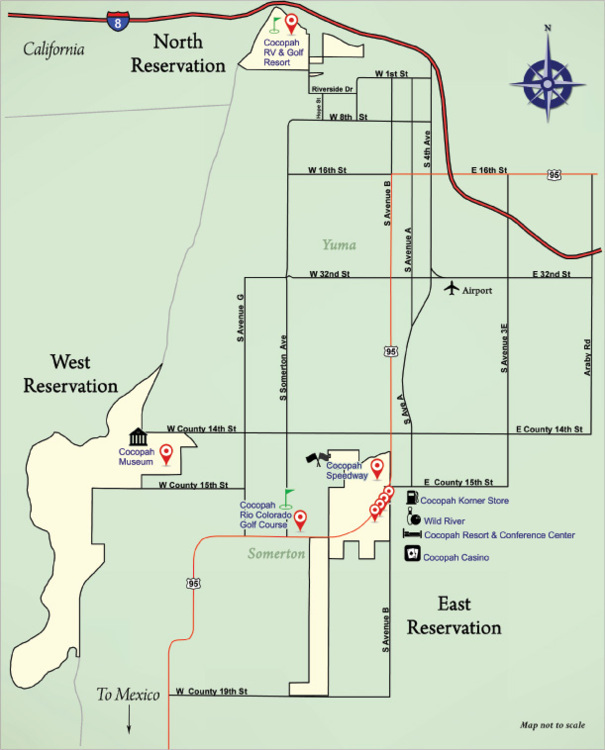 The Cocopah Reservation is conveniently located just a few miles from Yuma International Airport. For your convenience, if you are staying at Cocopah Resort & Conference Center, guests flying into Yuma can call us directly from the phone kiosk located near baggage claim. Just dial 20 to speak to our front desk. If you prefer flying charter contact the Somerton Aiport located about half a mile from Cocopah enterprises.